Today is day 4 of my 5000+ mile, 17 day motorcycle ride. We are still riding west down US 60. Our first stop today is just a few blocks away. 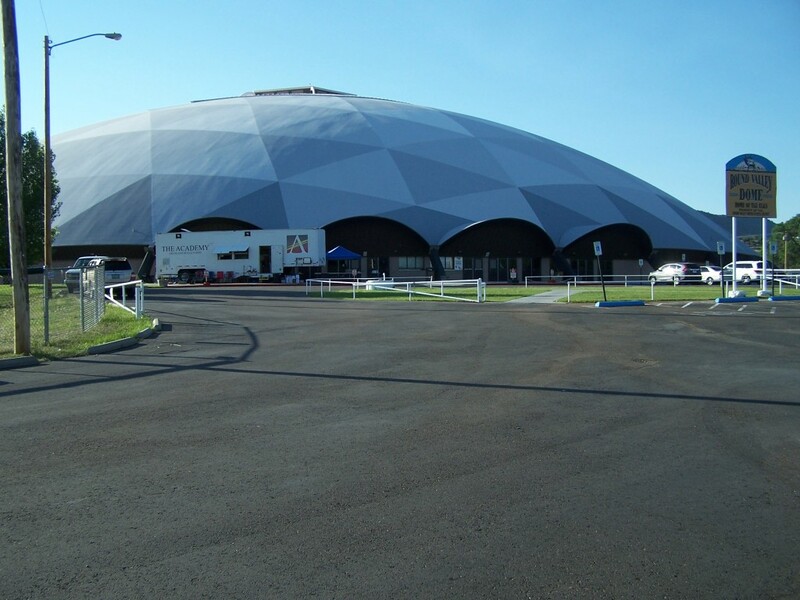 We are riding over to have a look at the first domed high school football stadium in the world… I’ve seen it from the outside before, but I’m hoping I can get a look inside. I’m a bit curious about how it was constructed… Luck is with us… I was able to have a look inside. Local high school marching bands are competing at the stadium. Several of the competing bands stayed overnight in the stadium. There were cots everywhere with sleeping kids. It was early and most, if not all, the kids were fast asleep. One of the chaperones let me in but requested I be as quite as possible so the kids could sleep. 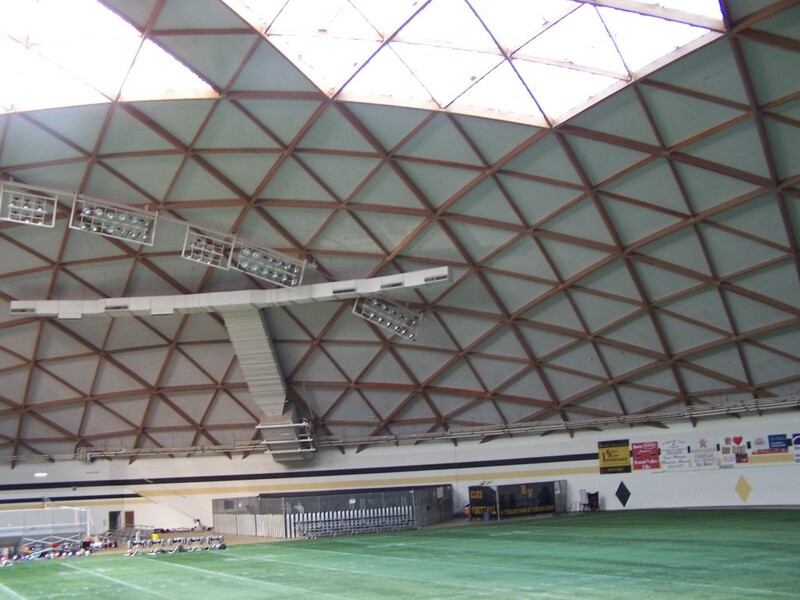 I spent a short time quietly taking pictures… I was amazed; the dome was constructed from laminated wood beams! I was in awe… At one time I wanted to study architecture and it was an engineering marvel to behold. I thanked my host and quietly excused myself. Riding to Ft Apache Photo by Larry A. It was early, but a bit warm for this time of the year, so we headed on down the road to Fort Apache. Judging from the last 3 days of riding it could get hot before the day’s end. 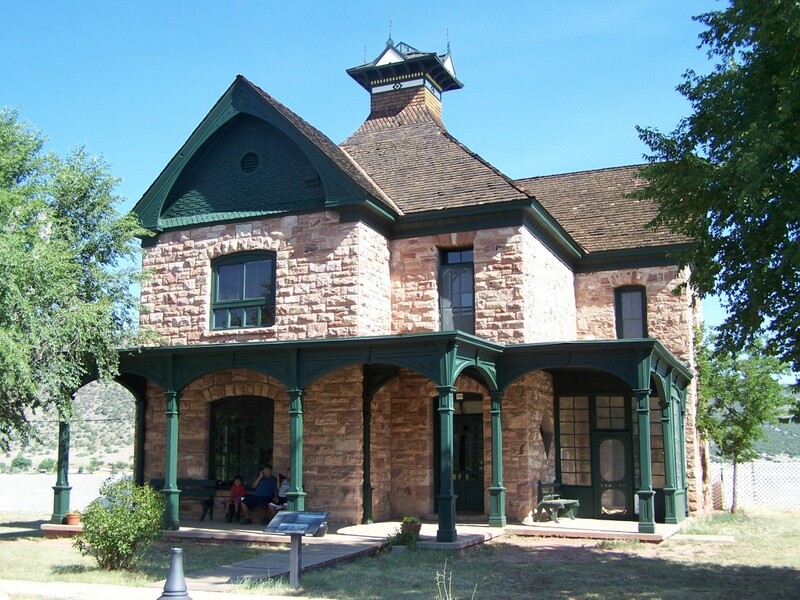 Fort Apache is just 60 miles down the road via highway 260/73. A detour from US 60, but a scenic detour, with a tree-lined roadway and rugged hill views in every direction. 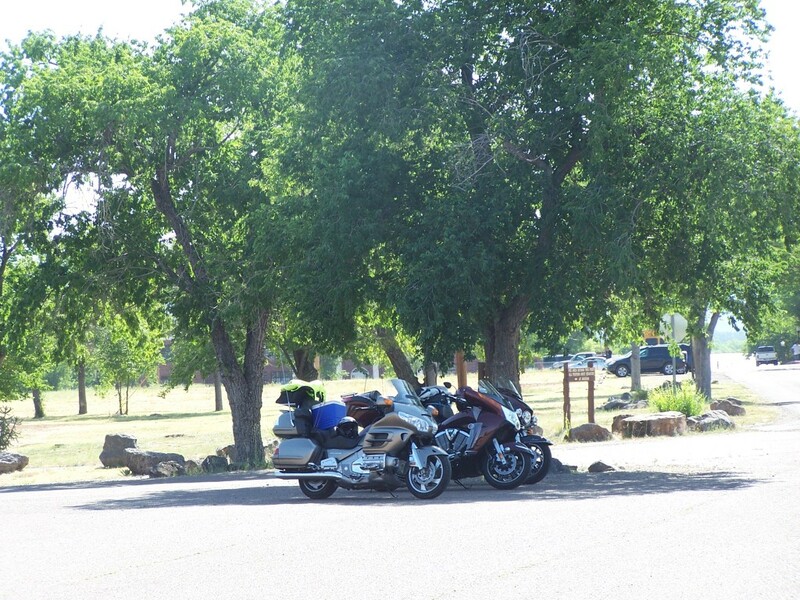 Arriving at Ft. Apache, Larry A. found us a shady place to park our bikes. We toured the displays at the cultural center and museum. 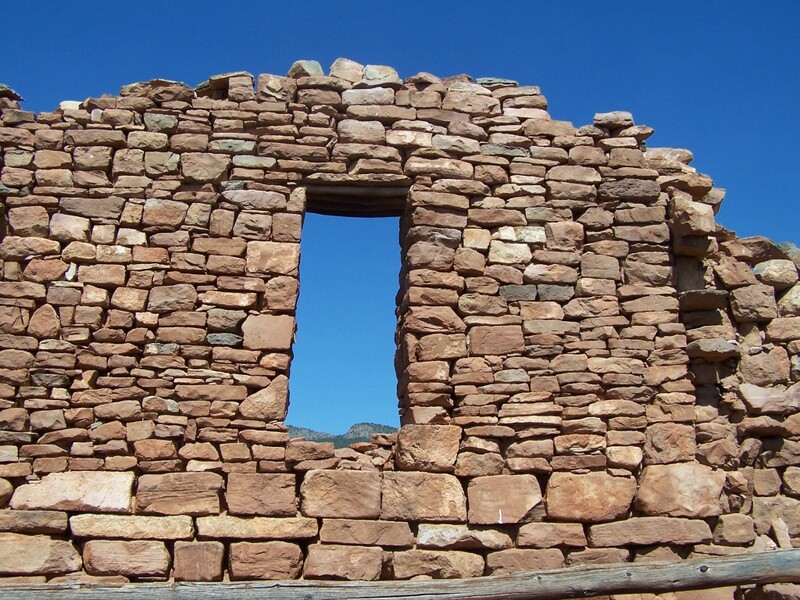 The cultural center is committed to the celebration and perpetuation of the Apache heritage. 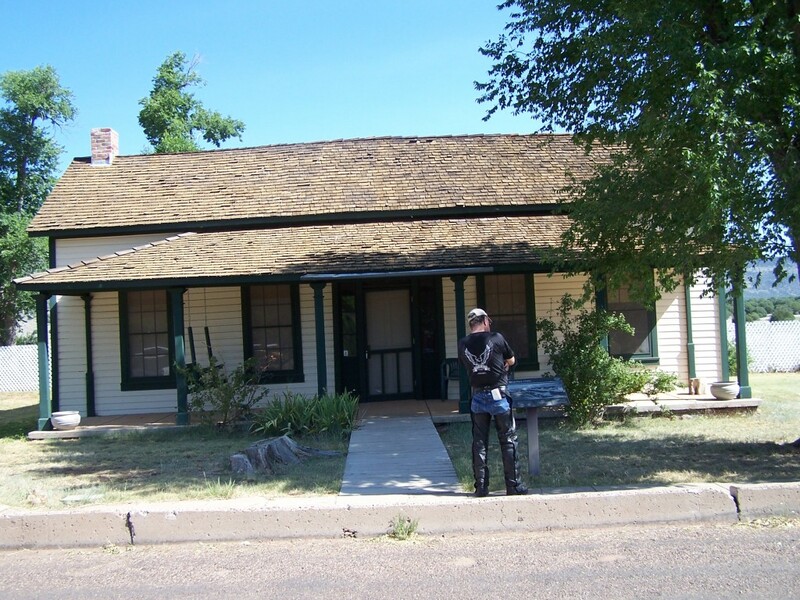 The museum has displays of Apache art, manuscripts, publications and historic photographs. After visiting the cultural center and museum we toured the various buildings on the fort. The fort has several structures ranging from an early log building to two-story dormitories, a headquarters building, sleeping quarters, corrals, storehouses, a guardhouse, a magazine, stables and an old military cemetery. 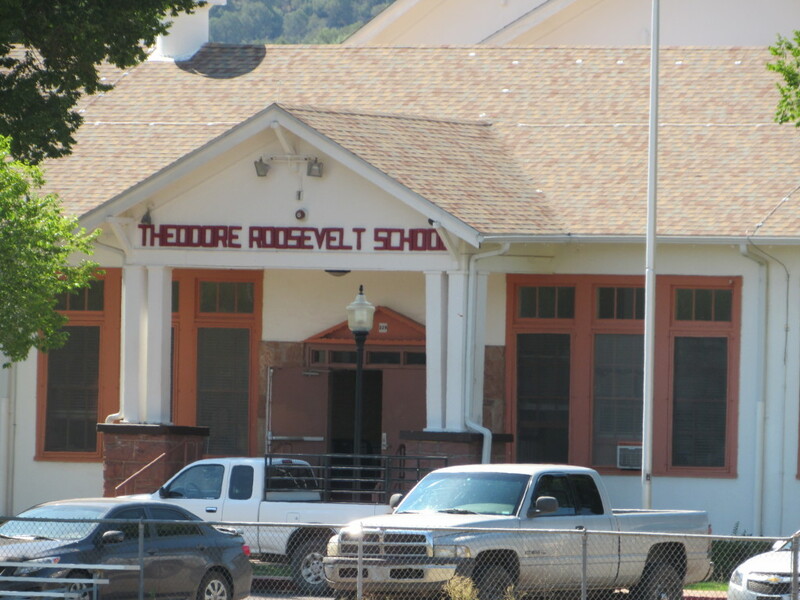 In 1923 the fort became the site of the Theodore Roosevelt Indian School and still operates to this day. 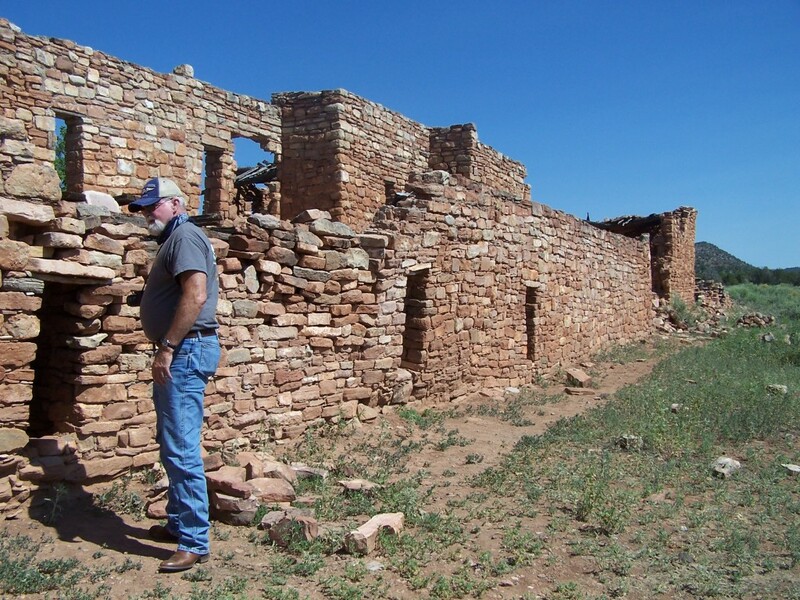 To get to the Kinishba Ruins take Hwy 73 west 2.7 miles, then turn right onto W. Kinishba Road. Follow the road about 2 miles to the ruins. The W. Kinishba Road is hard packed gravel that is a bit rough and dusty. At the ruins the turnaround area is a bit tricky on a motorcycle. 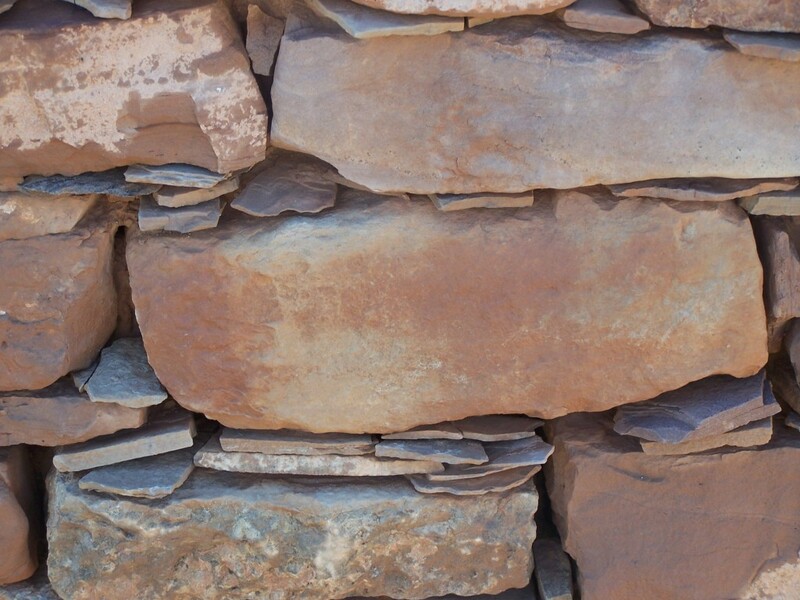 The area is covered with smooth stones fist size and larger. I would suggest making the turn while maintaining your speed and park so you are headed out to the road. Back on the road we headed 22 miles west on Hwy 73 to continue our ride down US 60. 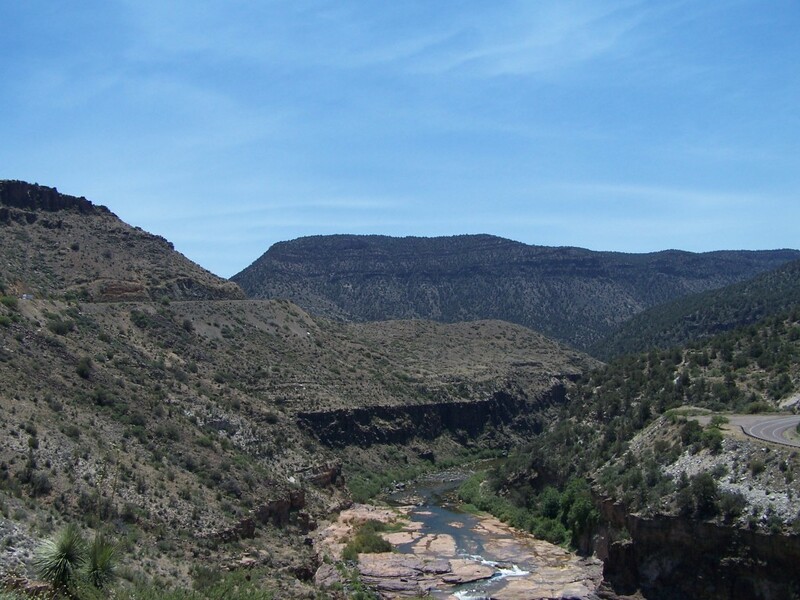 We are riding to the scenic Salt River Canyon. This is our second canyon on this ride. 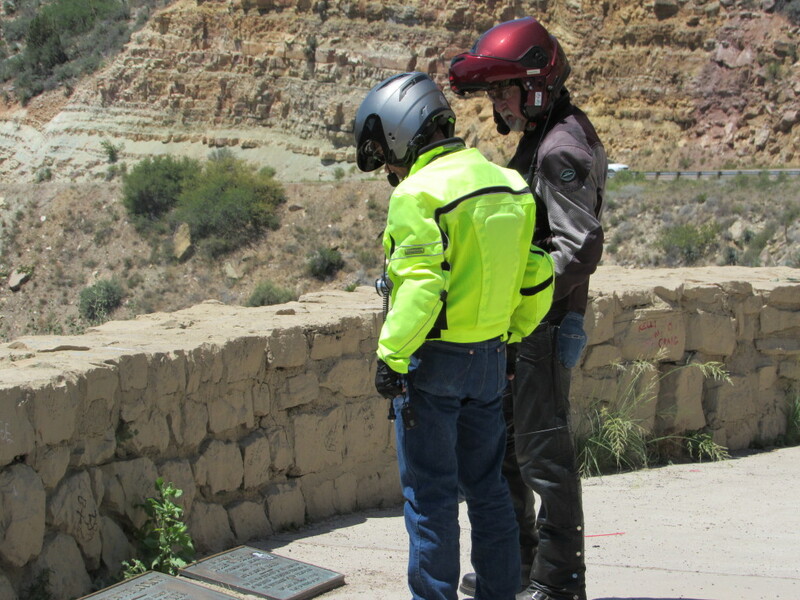 The Salt River Canyon has stunning scenic views, breathtaking twisty turns up and down throughout the ride. It is like riding the rim of the Grand Canyon but with turnouts for photo ops. As in our past 3 days, the temperature is rising and getting hot so we didn’t make a lot of stops. 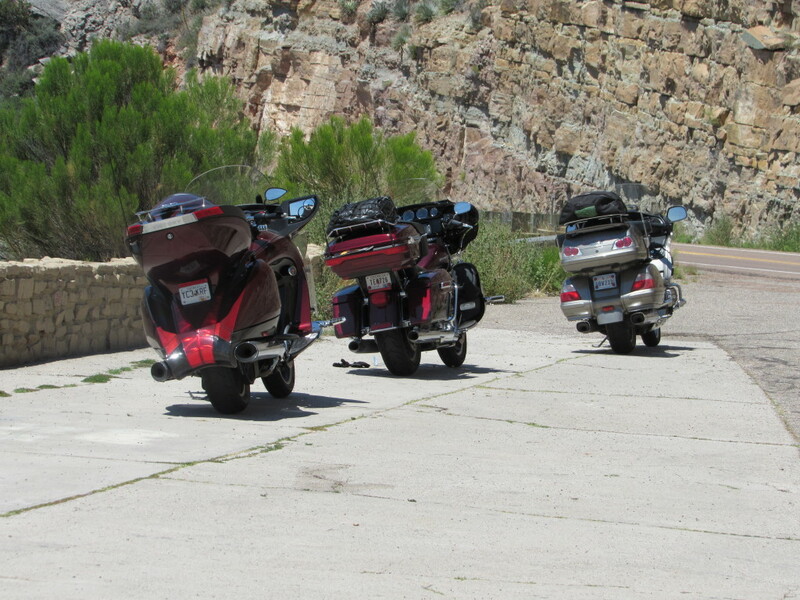 Riding into Globe, AZ after leaving the canyon area the temperature climbed to 103 degrees (F). We were ready to get to Globe, get out of the heat and finally eat some lunch. I’ve been to Globe several times over the years and it is a place you may want to have a closer look at. Globe is an old mining town with a lot of colorful history. I like the old downtown area because of its old buildings and the small town businesses. There are several locally owned restaurants with hometown ambiance that you may want to check out. Spend some time walking around downtown rubbing shoulders with the friendly people of Globe and check out those businesses. Because of the heat taking its toll on these three old men, we didn’t spend much time here today, but decided to get back on the road. 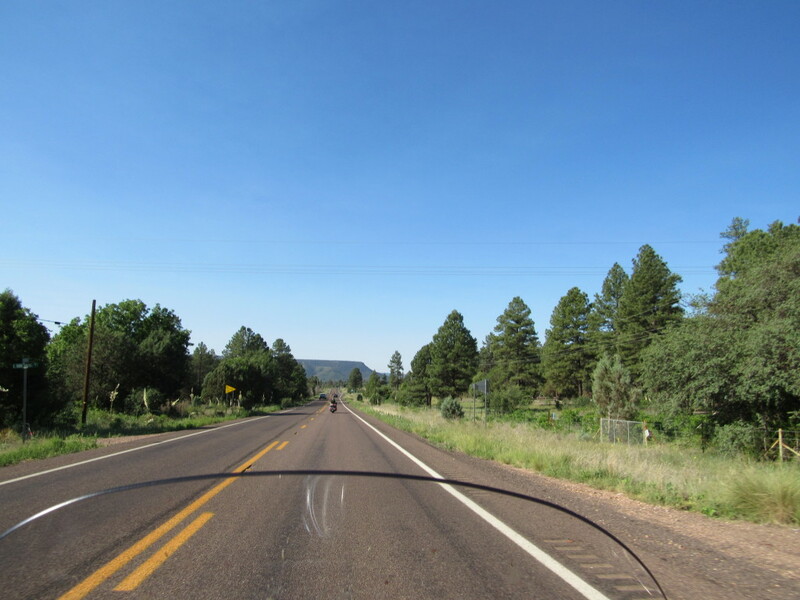 From Globe we leave US 60 behind and head up Hwy 188, 89 miles, to Payson, AZ. 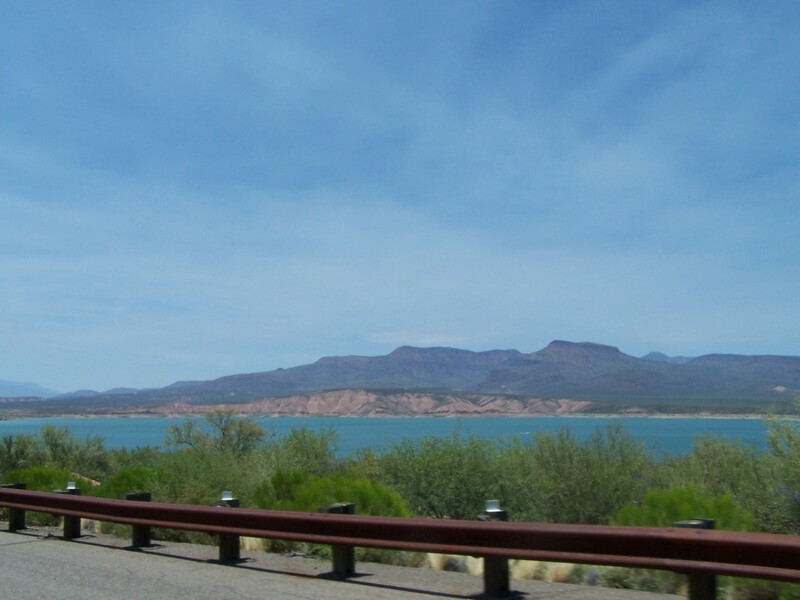 The ride to Payson was a scenic ride with panoramic views of the surrounding mountains. 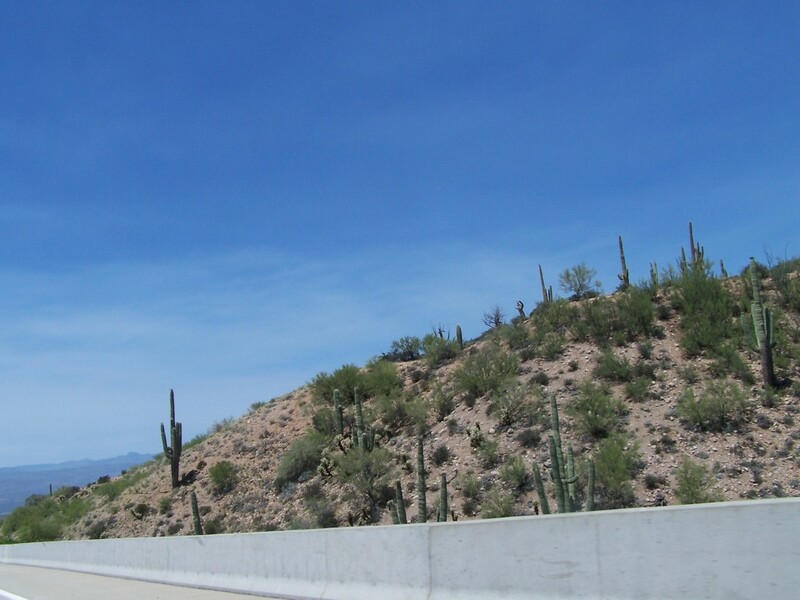 There was a surprising number of Saguaro Cactus along the roadside. Riding past Theodore Roosevelt Lake we looked down on the beautiful cool blue lake that looked very inviting to three very hot motorcycle riders. 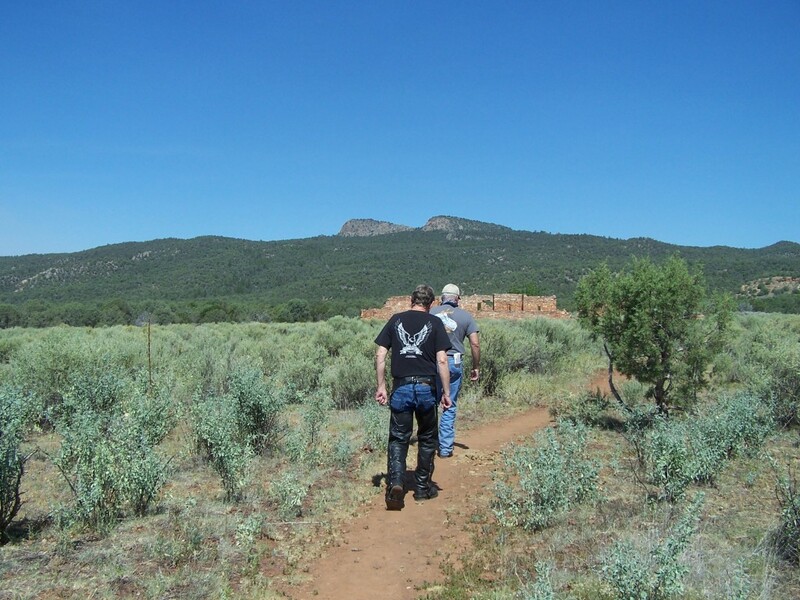 Tomorrow we will pick up US 89/89-A north of Prescott, AZ. We head north on twisty US 89-A to Jerome and then on Sedona, Flagstaff and stay the night at the Cameron Trading Post in Cameron, AZ. 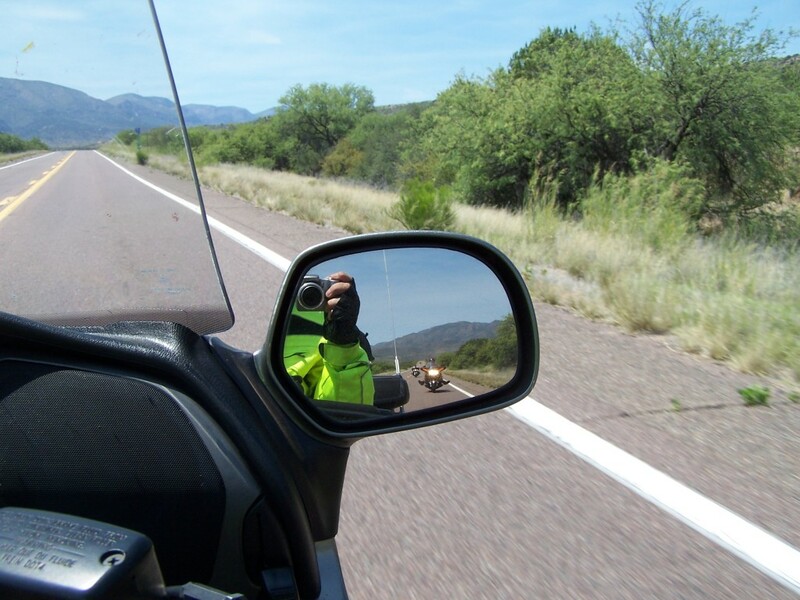 This entry was posted in Motorcycle Touring Logs and tagged long distance motorcycle touring, long distance motorcycle travel, motorcycle ride, motorcycle riding, motorcycle road trips, Motorcycle Touring, motorcycle travel, motorcycle trip, travel. Bookmark the permalink. Some nice pictures there, TR, but what about the bikes? It would be interesting to hear how the three different solutions to the same problem fared. With the slightly more agricultural charm of the HD against Victory’s more sophisticated take on the big V twin, and the high tech multi cylindered Wing, it would be fascinating to hear how these three two wheeled Winnebagos compared – especially in the twisties. I know I ditched the stock air shocks on my old Glide many years ago, in favour of a pair of stainless steel Hagon Nitros and progressively wound fork springs (with heavier oil). This was in an attempt to cure the sphincter exercising weaving and head shaking that would occur when you found a dip in the middle of a fastish (80 – 85mph) bend, especially with luggage on board. There are bends on one of the autoroutes in South West France that can ground the footboard brackets on my 25 year old FLHS at normal European highway cruising speeds. I decided to forgo a little of the plush comfort for sharper handling. Interestingly, once in the mountains, some of my riding mates on big Jap sports bikes, and ‘sports tourers’ (Yeah… right!) had trouble with the bends. Tight uphill hairpins are easier with the torque of my S&S than when you’re fighting between slipping the clutch, being in the right gear, and keeping the front wheel on the ground as you pull out of them. How are these more modern big tourers in these kinds of situations? Has technology dealt with it, or simply made the bikes heavier and more complex? Enjoy your trip. It sounds like a lot of fun, though a bit bloody warm! Ride safe, and don’t forget: the secret of eternal youth, is to refuse to act your age until you’re too old to change your ways. Chris, I ride the Victory, it is A great handling bike it the curves, also more leg room that the HD, way more than the wing, I have rode A HD, but not the wing, just sat on one knees rubbed the fairing, made me feel cramped, No stock bike has the power of that big flat six, but the victory is pretty close, Hope this helps. Just curious, Larry. That’s all. I’ve toured on various bikes over the last 45 years or so, from a 350 G3 Matchless, A65 Beezer or café race styled BMW R90 to a Suzuki Intruder 750 and the FLHS that I’ve had for the last twenty three years, (though it’s a lot different now to how it started life – nearly twice the power for a start, and a lot lighter, better braked, and better sprung). I also used to do 50K miles a year as a despatch rider on GT250 two stroke Suzukis and later GS425s. My brother uses a Rocket 111 with Corbin ‘Beetle Bags’ for long hauls, as well as around the mountains near his home. Now that bike has got some grunt, and is amazingly capable in the twisties ot trickling through villages too. He’ll think nothing of slapping a windshield on it, then riding the 750 miles from his home to the Channel tunnel in a day. That bike is just so effortless to ride, and despite its weight, is easy to chuck around even for a shortarse like me ’cos of the low seat and C of G.